If you’re laughing at the title of this post, it’s probably because you’ve been there. You got all excited because some new superfood snack came out, but when you tried it it taste like Mother Earth herself. 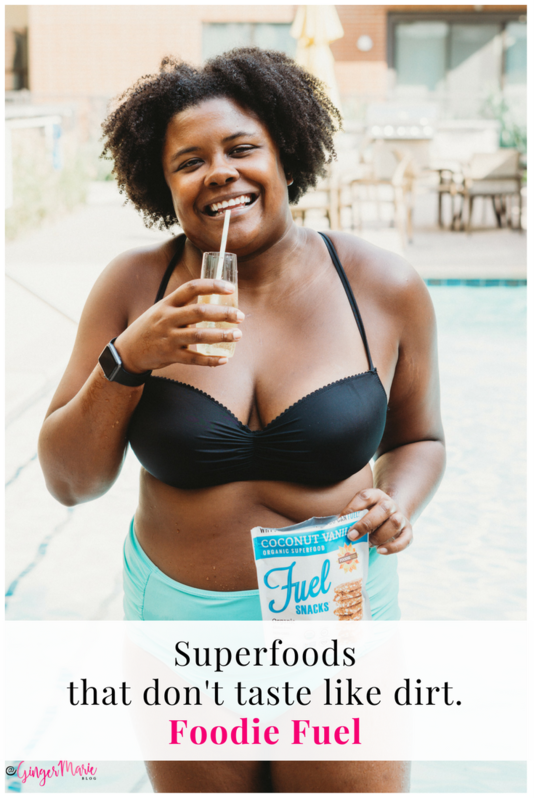 As a blogger, I get sent superfood snacks all the time, and in most cases, I’m simply not a fan. No matter how healthy the food, I can’t bring myself to share a product with y’all that makes me gag. Trust me, it’s been that bad a few times and I refuse to put those items on my blog! However, we finally have hope. 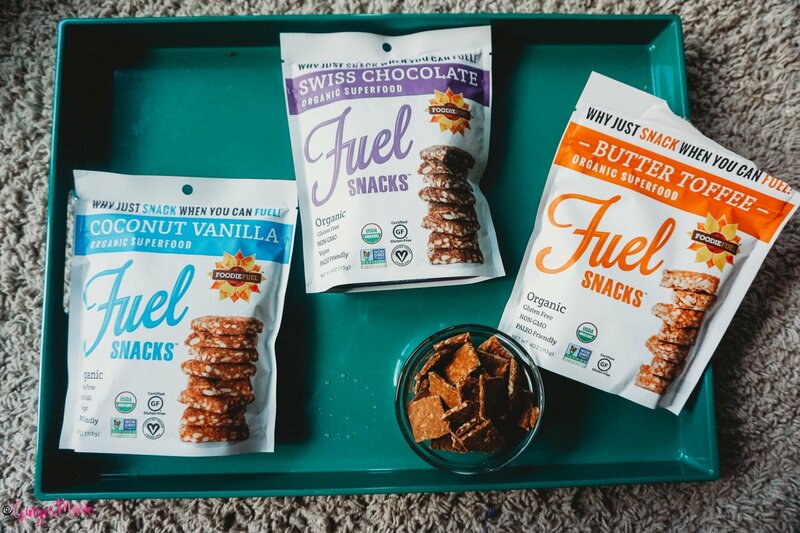 Foodie Fuel recently sent me some of their Fuel Snacks and I was totally caught off guard. Like I said, I just haven’t had many positive interactions with superfood snacks so I tried these cautiously. To my surprise, they were delicious. And not in a “oh this tastes good, but I would never actually buy it” way. More like, “Oooh these are good. Here – try one. But just one then give me back my snacks” kind of way! They’re sweet and flavorful, yet I can still eat them with zero guilt! 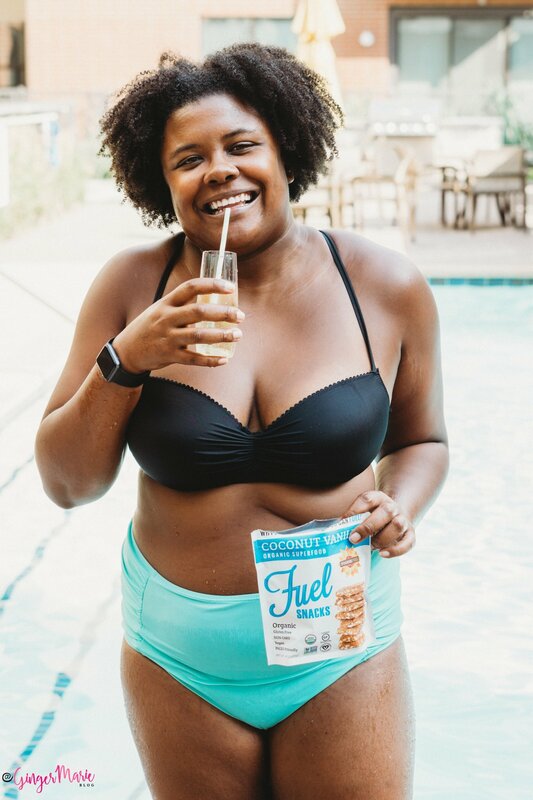 They were perfect for a relaxing pool day (as seen in these pictures) and didn’t make me feel super bloated in my swimsuit! I had my friend, Janna, try them and she agreed they were tasty as well. She’s not a huge fan of coconut-flavored treats, so I kept that whole bag to myself! They come in a bunch of different flavors, but I tried the Cinnamon Ginger, Butter Toffee, Swiss Chocolate, and Coconut Vanilla flavors. My favorite, of course, was the Cinnamon Ginger (hence it not being pictured because I scarfed it down right when I received it). But Butter Toffee came in as a close second! 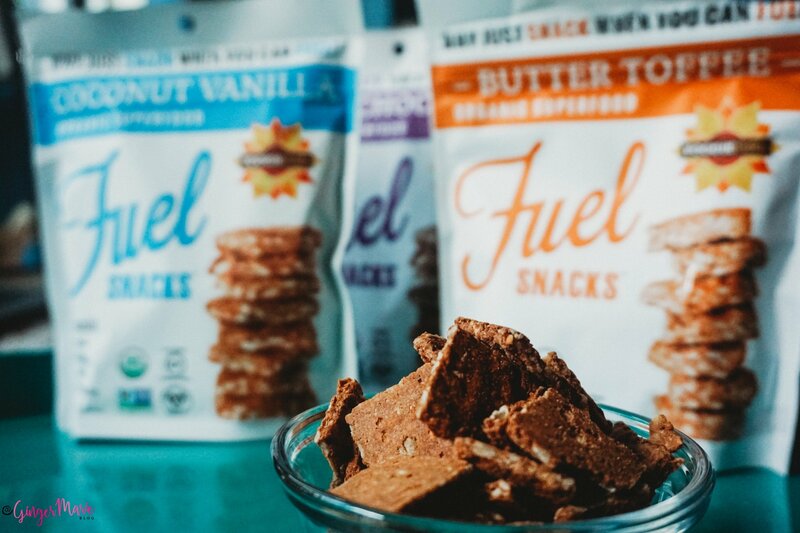 I love that these snacks are organic and PALEO friendly. Some of you will also like that they are Gluten-Free! Most importantly, they’re delicious and they don’t have an annoying amount of sugar. For some reason, sugar makes me sleepy so I always take a look at that on the Nutrition Facts! Let’s be honest. 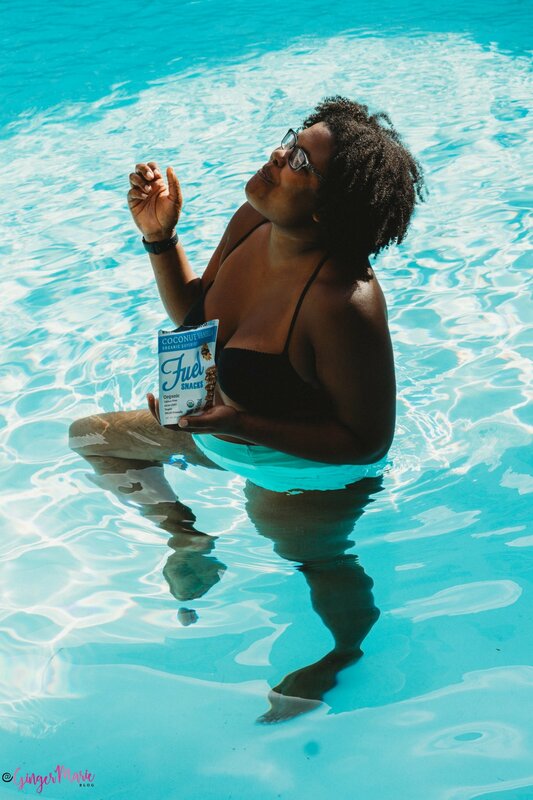 Does anyone else go to the pool more at the end of Summer than they do at the beginning of Summer? There’s something about knowing that your time is running out that makes you want to make the most of it. (That should be quoted somewhere. I think i’m gonna share it below). Anyways…what was I saying? I completely forg…OH YEAH! Time is of the essence and swimming time is coming to an end. 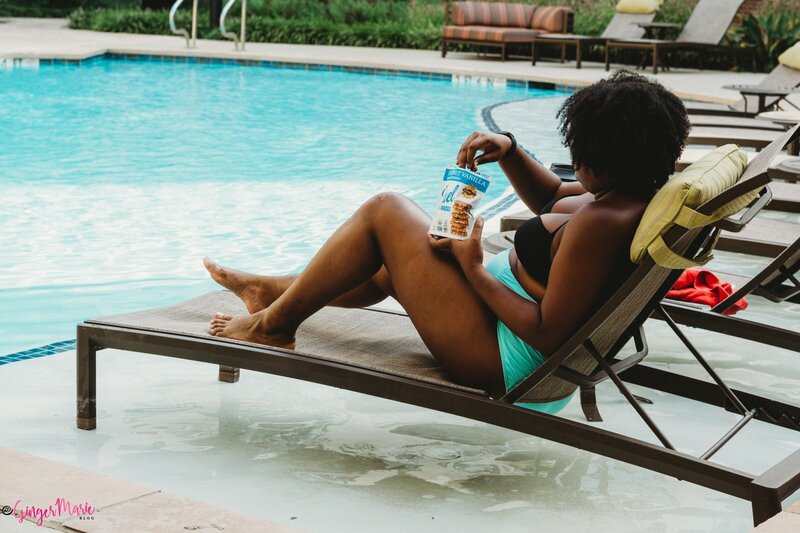 I love having snacks like these (and a glass of wine) poolside to help me stretch out my lounging time! There’s something about knowing that your time is running out that makes you want to make the most of it. 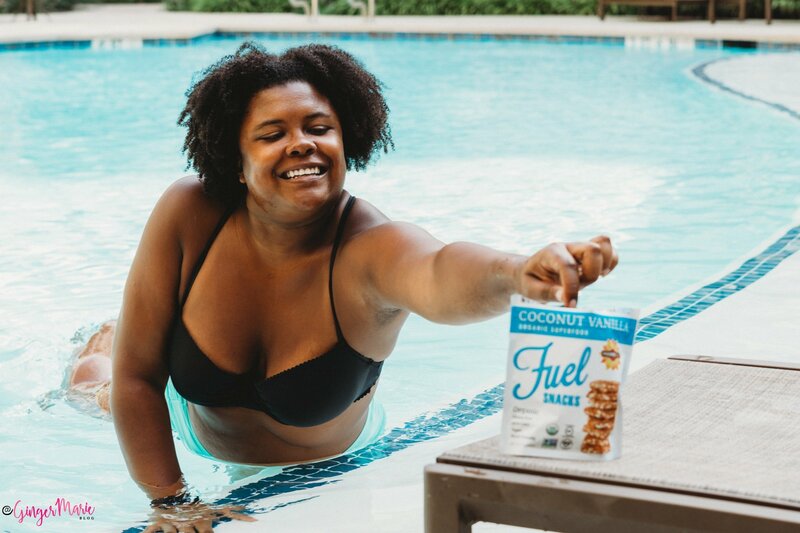 If you want to find out more about Foodie Fuel and what they have to offer, click here! Let me know in the comments below which flavor you’re most excited to try! This post was sponsored by Foodie Fuel through my partnership with Mambo Sprouts. All opinions are my own. Love the title. It is so true…it is hard to fine superfood snacks that don’t taste like dirt. I will have to check these out. Loving these snacks. Definitely perfect while relaxing by the poolside.